Live performance this first fridayfrom 6pm-8:30pm. We also have Happy Hour all night (every Friday). 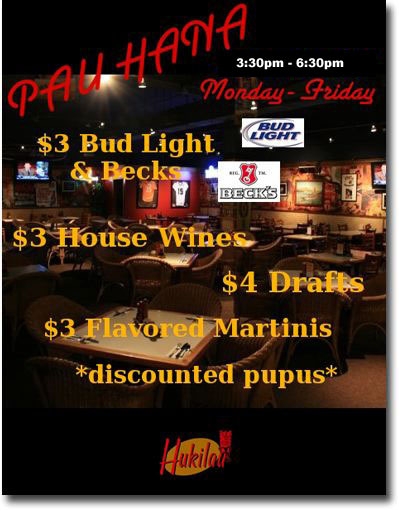 This includes $3 flavored Martinis, house wines, and Budlight, $4 draft beers, $5 Guiness. Shot Specials, and Discounted Pupus all night. Sushi specials and Fresh Moi, along with our regular drink specials. Featured entertainers on First Friday. Music starts at 6:00pm to 9:00pm. Hukilau was founded by three guys from Hawaii who were homesick for the local-style food they grew up on and the relaxed and festive island feel of places back in Hawai'i. Kurt (Kapa'a, Kauai), Al (Ewa Beach, Oahu) and Eric (Hilo, Hawai'i) created the Hukilau and infused it with a taste of each of the three islands and the spirit of Aloha. Soon they were joined by Rodney Park, who added even more flavor. At the Hukilau, you will be transported back to your favorite "plate-lunch" restaurant in small town Hawai'i, you will hear the strummings of live Hawaiian music like "uncle" used to play at family gatherings, and you will also be able to order tropical cocktails just like at the bars on Waikiki. Combining Pacific Rim and California cuisines, Executive Chef Jason Takemura brings his culinary inventiveness and commitment to quality dishes to the new Hukilau, Honolulu, which opened in May in the Executive Centre Downtown. Formerly of Chai's Island Bistro, Takemura, who trained at Le Cordon Bleu-affiliated Western Culinary Institute, brings a decade of experience in the kitchens of several California restaurants, including Roy's, Monterey's Montrio Bistro and Pebble Beach's Inn at Spanish Bay. "Freshness is what we emphasize on the Hukilau's menu, from seafood specialties, robust and healthy salads, to baked-on-site dessert creations," says Takemura. Takemura's wide-ranging culinary experiences, including Italian, Japanese, Pacific Rim and American dishes, has enabled him to create palate-pleasing lunches, including a Portabello Katsu with melted Brie Cheese Sandwich and unique bento lunches, made fresh daily, for the on-the-go downtown crowd. In addition to breakfast, lunch and dinner service, Hukilau provides catering services. Go to www.dahukilau.com. "Incorporating Pacific Rim cuisine with California cuisine fits right into our philosophy at the Hukilau to support our local community and the Aloha Spirit," says Takemura. Aloha Served Here! Kurt (Kapa'a, Kauai), Al (Ewa Beach, Oahu) and Eric (Hilo, Hawai'i) created the Hukilau and infused it with a taste of each of the three islands and the spirit of Aloha.